It's Halloween...almost! 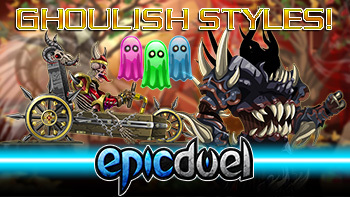 Check out this week's update for new ghoulish weapons, travel forms, and armor. Plus, new balance updates and bug fixes will round out this exciting update! Visit Xraal in the Biological Preserve to check out the latest in spook-tacular weaponry and travel forms! I know so little about sports that Teufel Hunden had to remind me that the World Series was currently underway. That's not a nerd pride thing. That's a Cleveland sports thing. You get burned enough, you stop touching the stove eventually. Anyway, pick up the new Big Show 2018 Achievement from the shop while it lasts! I'm happy to announce that EpicDuel will be receiving 3 in-game items for buyers of the 2019 Calendar! 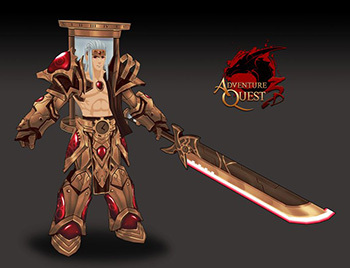 This will include the Corrupted Chronomancer Armor, Chrono Cluster Sword P, and Chrono Cluster Sword E! I'm happy to say that the search for testers has concluded, and the final candidates have been contact. However, because all the candidates haven't yet been trained and signed NDAs, we're not ready to announce at this time. If you weren't contacted, it doesn't mean that you weren't a strong candidate, but you didn't make the cut this time. We'll probably use this list of candidates when we're looking for more testers, so fuming about our choices on social media probably won't boost your chance, especially if you were very close to the cutoff. I've very excited to get our new testers trained and ready to help us address some of the biggest challenges facing EpicDuel, especially as we head into the busy holiday season!